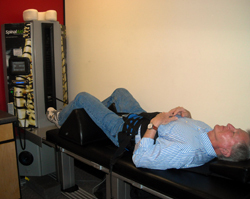 Many of our patients have been excited with the amazing results they received after utilizing Spinal Decompression. Many spinal conditions are caused by compression to the spinal vertebrae. This compression puts pressure on and irritates spinal nerves. It can also tear or rupture spinal discs. A frequent casualty is the soft disc material that separates each spinal bone. Pressure from our weight, trauma from an accident and other causes can increase the pressure on a weakened disc. In extreme cases, the soft pulpy center of the disc can escape. That can be quite painful. Since discs are constantly under weight-bearing pressure, they can be slow to heal. By gently “stretching” your spine, we help relieve pressure and enhance healing. This is called disc decompression. First, we’ll have you lie down on our specially-equipped table. Then, ever so slowly, we’ll stretch your spine. And then relax it. Stretch, and relax. Our patients tell us this tractioning process is quite pleasant, even relaxing. Because they don’t feel the need to “guard” their spine, each sequence helps the damaged disc receive nourishment, expel cellular waste and enjoy reduced pressure. Then, healing can begin. Spinal Decompression not only significantly reduces the back pain experienced by many patients, it also allows them to return to their active lifestyles. 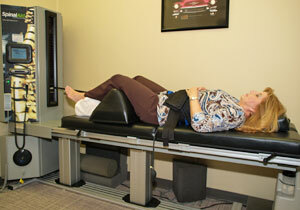 Spinal decompression therapy at Ballantyne Advanced Chiropractic. Many of our patients have been excited with the amazing results they received after utilizing Spinal Decompression. All of these patients had previously been given medication, tried physical therapy, or were told they would need surgery. While we can’t guarantee that surgery will not be needed in the most severe cases, we can promise that we will do our best to help you explore all of your other options. To begin feeling like yourself again, contact our office at Ballantyne Advanced Chiropractic or use the email link below to schedule an initial consultation with Dr. Jason Usher to determine if you could benefit from Spinal Decompression.